Teacher evaluation has too often focused on affixing ratings to teachers rather than helping them grow into mastery. The practical, field-tested model proposed in Teacher Evaluation That Makes a Difference has everything your school or district needs to provide teachers—and, by extension, their students—with the support necessary for success. "Authentic evaluations and finding ways to improve our professionalism are the first in a series of steps we must take to begin this evolution in our education system. The strong, research-based recommendations in Teacher Evaluation That Makes a Difference are a great place to start. I highly recommend this to all educators seeking to enhance their professional lives." "Teacher Evaluation That Makes a Difference is a valuable, hands-on reference and resource for principals and educators confronting real-world challenges, and highly recommended." Reprinted with permission from the Midwest Book Review. 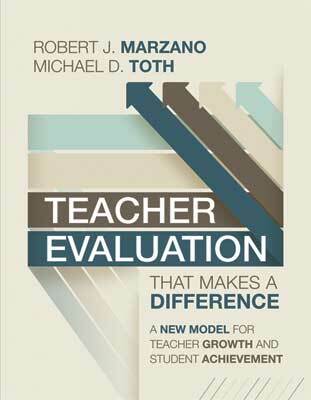 "When evaluating teachers, a new book by Robert Marzano and Michael Toth, Teacher Evaluation That Makes a Difference, offers a variety of tips that can be useful to school administrators." Reprinted with permission from Tech&Learning. ROBERT J. MARZANO is CEO of Marzano Research Laboratory and executive director of the Learning Sciences Marzano Center for Teacher and Leader Evaluation. A leading researcher in education, he is a speaker, trainer, and author of more than 150 articles on topics such as instruction, assessment, writing and implementing standards, cognition, effective leadership, and school intervention. He has authored over 30 books, including The Art and Science of Teaching (ASCD, 2007). MICHAEL D. TOTH is founder and chief executive officer of Learning Sciences International, iObservation, and the Learning Sciences Marzano Center for Teacher and Leader Evaluation. Formerly the president of the National Center for the Profession of Teaching, a university faculty member, and director of research and development grants, Mr. Toth transformed his university research and development team into a company that is focused on leadership and teacher professional growth and instructional effectiveness correlated to student achievement gains. Mr. Toth is actively involved in research and development, gives public presentations, and advises education leaders on issues of leadership and teacher effectiveness.